The US dollar managed to stem the strong declines after developments from Washington saw a special counsel being set up to oversee the investigations into the alleged Trump administration links with Russia. 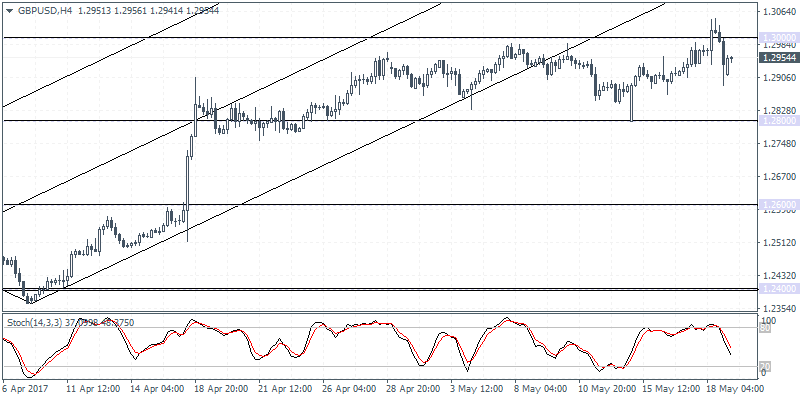 The US Dollar Index which was seen trading at support managed to rebound with confidence. Technical resistance is seen at 99.23 which should help the greenback to recover some of the gains. On the economic front, the weekly jobless claims fell to 233k, better than the forecasts of 240k while the Philly Fed manufacturing index rose to 38.8 in May, beating estimates of 18.5 and rising from April's 22. In the UK, retail sales figures surprised, rising 2.3% on the month. Looking ahead, Statistics Canada will be releasing the monthly inflation and retail sales figures today. Headline inflation rate is expected to rise 0.5% on a month over month basis in April, while core retail sales are expected to rise 0.2%, reversing the 0.1% decline posted in February. EURUSD (1.1111): EURUSD formed a strong bearish outside bar yesterday after price touched a new 6-month high at 1.1171. Price action is likely to move into consolidation, but further downside cannot be ruled out. 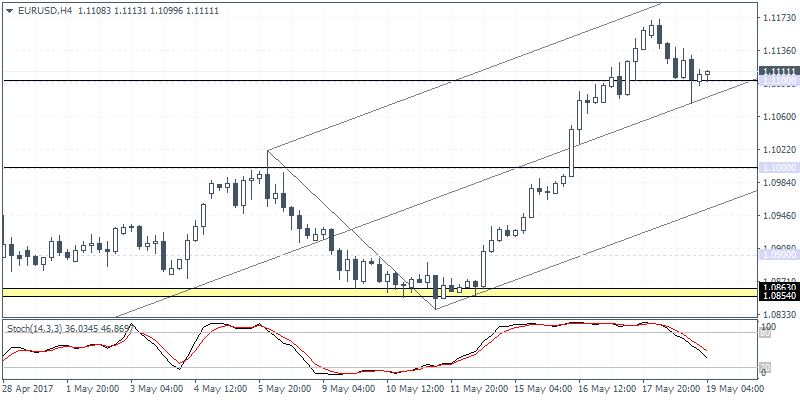 For the moment, support at 1.1100 is seen to offer some support pushing prices higher. A break down below 1.1075 which marks the lows from Wednesday is required for price action to continue lower. Initial support is seen at 1.1000. To the upside, in the event of a rebound in prices, further gains can be seen coming only on the move above the previous highs at 1.1170. GBPUSD (1.2954): The British pound has retreated just after breaking past 1.3000 level and similar to the EURUSD, the GBPUSD has also closed with an outside bar. This suggests a potential continuation if price breaks out above 1.3000 while to the downside, a close below Wednesday's lows 1.2905 will trigger a move towards the support level at 1.2800. The longer-term target at 1.2600 remains in place however which could be realized in the event that price can continue to break down lower. 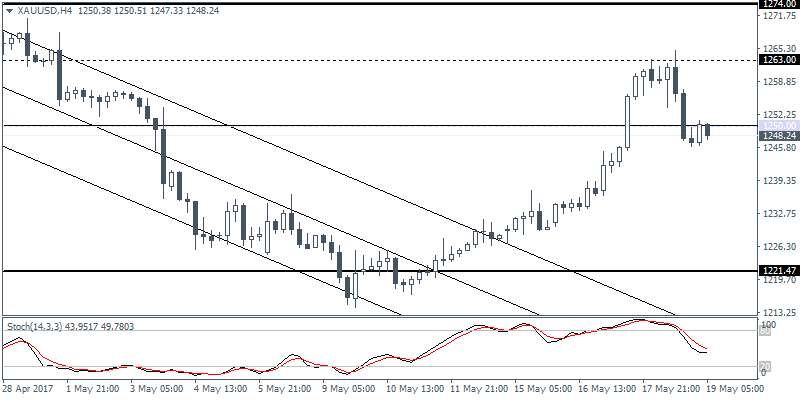 XAUUSD (1248.24): The bullish retracement in gold prices sent the precious metal briefly above $1250 handle without price testing the $1221 support. The price action in gold hints at a possible downside move in prices. Currently, gold prices are seen retesting the 1250 handle where resistance could be seen forming. A bearish decline from here will validate the resistance and put gold prices on track to test the lower support level at 1221.47, from where we expect to see a renewed bullish momentum potentially push gold prices back above the $1250 handle.